Storage Guardian is a reliable, cost-effective, fully automated backup and recovery software solution, backed up to their mirrored, secure, SSAE-16 certified offsite data storage infrastructure. The service is tightly integrated with ConnectWise Manage and Automate. Deploy Storage Guardian’s award-winning backup and disaster recovery services on your customers’ networks – directly from within ConnectWise Manage and Automate. Protect customer data with Cloud, Local (on-premise) or Hybrid-type storage. Enable the wealth of data accumulated in Asigra-based data centers across the USA and Canada to be consolidated with your ConnectWise data to streamline the monitoring and support of clients. Storage Guardian's tight integration with ConnectWise Manage and Automate means that the service can be managed directly from within ConnectWise. 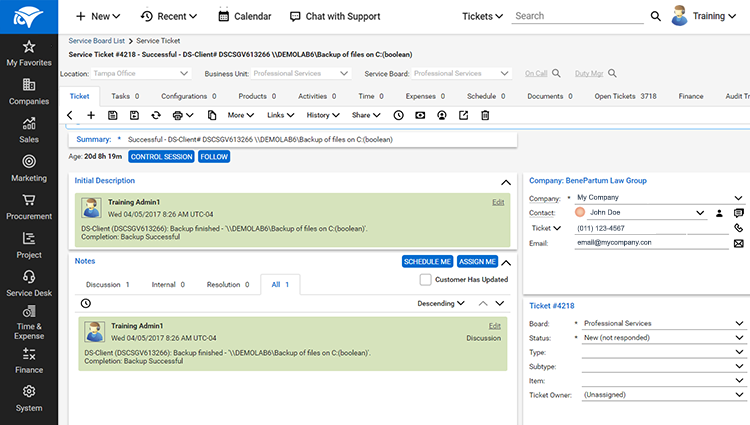 Service Board tickets "self-heal" and resolve automatically, giving you a clean dashboard that isolates critical issues and reduces the time spent to manually close tickets. Monitor your customers' RTO/RPO easily, and access complete billing data based on your customers' usage. The ConnectWise Manage and Automate APIs allow for the exchange of data with the BDR software. These consolidate the backup set activities and the corresponding event ticketing management, the deployment management, the monthly billing reporting and the analytics on the data recovery / business continuity preparedness. Requirements: Storage Guardian's BDR service provides broad support for all major operating systems, virtualized environments, and cloud-based services including Office 365. The service is tightly integrated with ConnectWise Manage. View the ConnectWise Manage and Storage Guardian integration here. Deployment of Storage Guardian on your customers' sites is fast and easy, and can be initiated from within ConnectWise Manage. Service Board tickets close automatically if the issues that opened them were resolved, freeing up your time to focus on critical issues only. View RTO/RPO analytics to highlight potential downtime hours scenarios, and make sure your customers are adequately protected. Automatically updates ConnectWise Manage agreement additions to empower monthly recurring revenue. Requirements: Storage Guardian's BDR service provides broad support for all major operating systems, virtualized environments, and cloud-based services including Office 365. The service is tightly integrated with ConnectWise Automate. Has really been a pleasure working with Storage Guardian. Their support is responsive, pleasant, and knowledgeable. Their customer service has been top-notch. The software is reliable and effective. If any issues arose, they were addressed to our full satisfaction quickly and pleasantly. From getting the integration into Manage set up (which is really well designed and easy to use btw!) to onboarding new customers to restoring data, we are very happy we chose SG. 20 hours in, multiple tickets later, agents still fail, scripts fail, documentation is still for 10.5... This has been a big waste of time. We've been using Storage Guardian for a while and the technical support team at SG is always responsive and helpful. We had some struggles in the beginning understanding the SG backup model because we went to them from another backup provider that based their quotas only on the total amount of data, rather than how many days of retention they kept. SG took repeated calls from us and patiently answered our questions and concerns until we finally understood the process. We're glad we chose SG. David Herring, IT Kauai, Inc. Storage Guardian has proven to be an invaluable partner in enabling us to provide top notch backup and recovery services to our customers. Their software and cloud services have proven to be very reliable and their technical support has truly been excellent. And most importantly, when it comes down to it we've always been able to get our customer's data back! Highly recommended.